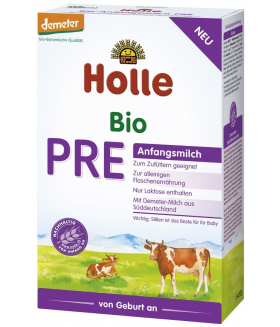 From birth 400 gConventional Holle organic milk formulas still have maltodextrin as a complex car..
after 6 months250 gIngredients:demeter wholegrain wheat flakes** 82 %, demeter wholegrain oat flakes..
from birth400gDemeter UseSuitable for use from birth on wards or if changing from breastfeeding. I..
after 4 months250 g Ingredients:Wholegrain oat flour*, vitamin B1 (required by EU law)*from bio..
as of the 6th month600gDemeterUseSuitable if replacing or in addition to breast milk. Suitable for ..